"My kickers are not bad guys. They just made bad decisions. And young people do that." 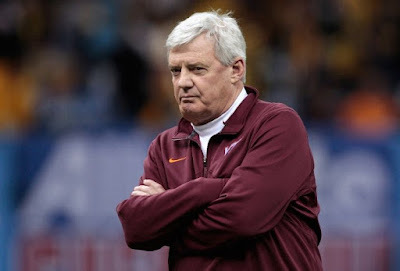 -- Virginia Tech head coach Frank Beamer who was forced to rely on third-string place kicker Justin Meyer in last nights game. Myer has been kicking off for the Hokies since he transferred in 2009 from Murray State. On December 30, Hokie Senior Tyler Weiss got sent home on a Greyhound bus Thursday after missing the team's 1 a.m. curfew. The punishment comes a week after starter Cody Journell was arrested and arraigned on charges of entering a Blacksburg house with the intent to commit a felony. Journell, who was released from Montgomery County jail Wednesday on a $100,000 secured bond, is suspended indefinitely from the team.